J.Dupion Residences comprised of only 399 units housed in 2 blocks of 39-storey service apartments and 10,300 sq ft of retail space targeted at lifestyle cafe and convenience outlets. Majority of units are positioned to maximise the KL City Skyline. The standard unit here varies from 803 sq.ft. to 1,565 sq.ft. whereas penthouse unit sizes are from 1,978 sq.ft. to 2,146 sq.ft. 5 lifts will serve only 7 units per floor. 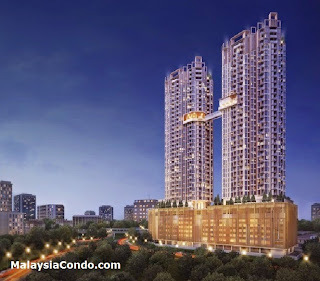 The development will be linked via a pedestrian bridge to the Taman Pertama MRT Station and will also be seamlessly connected to the developer's future phases. Built-up Area : 803 sq.ft. - 2,146 sq.ft.